It's Pumpkin Time in Central Illinois!! If you’re anything like us at BN Realty, you’ve been anxiously awaiting the fall season and everything that it has to offer… the beautiful reds, oranges and yellows of the trees, the apple cinnamon scents that fill the stores, the cooler weather, but most importantly including everything PUMPKIN! Although many people look forward to the pumpkin flavored food and drinks, we know that the experience of visiting a local pumpkin patch or apple orchard takes the cake. We are so lucky in central Illinois to have several options for us and our families. We’ve gathered together a list for you of our 5 favorites! Rader Family Farms: located at 1238 Ropp Rd, Normal IL. Not only can you pick your own pumpkins, but you can explore the corn maze, climb Tire Tower, slide down the Cattle Shoot, practice roping a steer, jump on a gigantic pillow, and visit their petting zoo. Rader Farms offers many options for visitors. You can purchase daily or season passes. They also offer specials on admission throughout the week. Tanner’s Orchard: located at 740 State Route 40, Speer IL. Tanners is celebrating their 70th anniversary this year! Tanners is known for their exceptional apple orchard and other great family activities. You can take Barrel or Grain train rides, pony rides, pedal cart rides and play mini golf or tether ball. Make sure to visit the farm animals like goats, llama, rabbits and chickens! The corn maze is also a fun adventure for those looking for a puzzle. Curtis Orchard & Pumpkin Patch: located at 3902 S. Duncan Rd, Champaign IL. They are known for their “U-Pick Apples” that include Empire, Golden Delicious and Ozark Gold. Don’t worry, you can pick your own pumpkins too! Admission is free and includes a playground and petting zoo. Tickets can be bought for the obstacle course, rope and corn mazes, putt-putt golf, giant slide and pony rides. Make sure you stop at the Flying Monkey Cafe where you can get lunch and snacks! Bomke’s Patch: located at 605 County Lake Road, Springield IL. 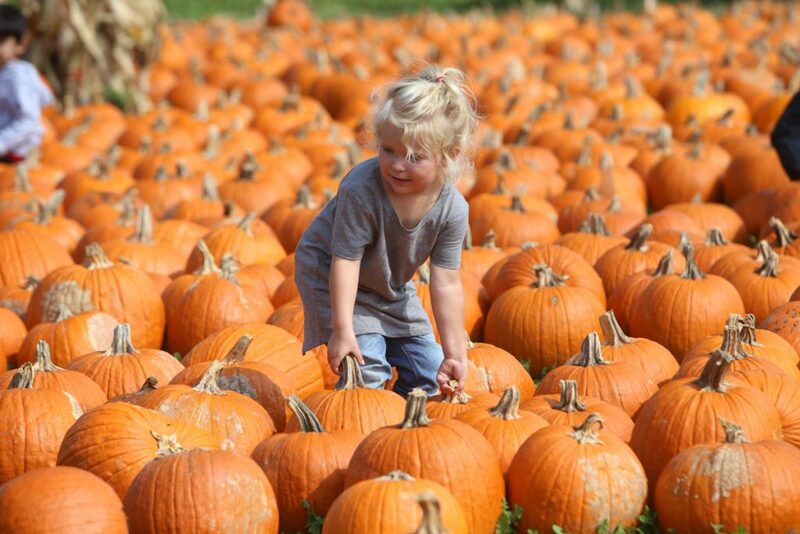 For the fall season it is filled with pumpkins, a corn maze, petting zoo, wagon rides and large country store. While there isn’t an entrance fee, there are many different activities that you can choose to do such as corn/bean maze, wagon rides, petting zoos. We love Bomke’s because each guest will leave with a complimentary bag of popcorn and a warm drink! In the colder weather this family farm doubles as a Christmas Tree Farm. Gail’s Pumpkin Patch: located at 1709 2000th Avenue, Beason IL. This is a 4th generation pumpkin patch that has many activities to offer! Aside from pumpkin and gourd picking, you can visit the popcorn wagon, pet the farm animals, navigate the tunnel maze, go on a Barrel Train ride, and play many games like gourd bowling, rope the bull, potato sack jump, and spinner gourds. Don’t let another beautiful weekend in Central Illinois pass you by! Grab your family and friends and visit one (or more!) of these fall attractions! Make sure you let us know how you enjoyed yourself or if you have another favorite that we missed!